When choosing your new home interior, it is important to start the process head on. Firstly, consider which room you are planning on redecorating first, ideally choose the largest room first that way when removing large furniture you are able to store dusty items in a room which hasn't been recently painted. Next on the list, is to choose your colour scheme, materials and sizes. Here at Mosaic Village we have put together an ideal room guide for your new mosaic tiles. The hallway is one of the first things people see when they visit your home, therefore as soon as a guest walks through your front door you want to make sure you give them a good first impression. Many people would use tiled flooring, however in order to make an even bigger statement – we recommend using tiles on the wall. Whether it be running along your stairs or a simple outline bordering your hallway mirror – anything is possible with mosaic tiles. Remember those bricked feature walls? Well now you can make that dreaded wall a sparkling success! Using sparkle mosaic tiles, you can create a luxurious feature wall for your living room or dining room. What once used to be a featured brick wall now is the mosaic tile feature wall. To ensure your feature wall stands out as much as possible, you can paint the rest of the living room a warm yet neutral colour and introduce the same neutral furniture. The kitchen is probably the most popular room in your home to decorate with mosaic tiles and we are proud to supply durable product which can sustain their luxurious attire. Here at Mosaic Village our kitchen mosaic tiles can help protect walls from damage, are well suited to the high heat and humidity. You can incorporate many mosaic tile styles in your kitchen, whether it be over your kitchen appliances or a full feature wall with accessories to match. Although most conservatories and patios usually consist of windows we know there is additional space for some luxurious mosaic tiles to add a bit of glam to a simply brick wall. Perhaps even just mosaic border tiles to outline the edge of the patio, introduce a mosaic tile coffee table and you have yourself a perfectly cosy conservatory. Another popular room to incorporate mosaic tiles is the bathroom. The bathroom requires tiles which can handle constant humidity, heat and wet areas therefore we a proud to supply bathroom mosaic tiles that can uphold exactly that. The most popular use of mosaic tiles in the bathroom is when decorating a wet room or walk in shower enclosure. Horizontal stripes allow the room to look bigger than what it actually is, creating a luxurious illusion. Simply introduce a large bathroom mirror and you have yourself a picture perfect bathroom ready for relaxation. Additionally, the downstairs toilet can be a place for redecorating, the small somewhat boring room can be rejuvenated using metal mosaic tiles. This can really make the room pop and look inviting when having guests over. 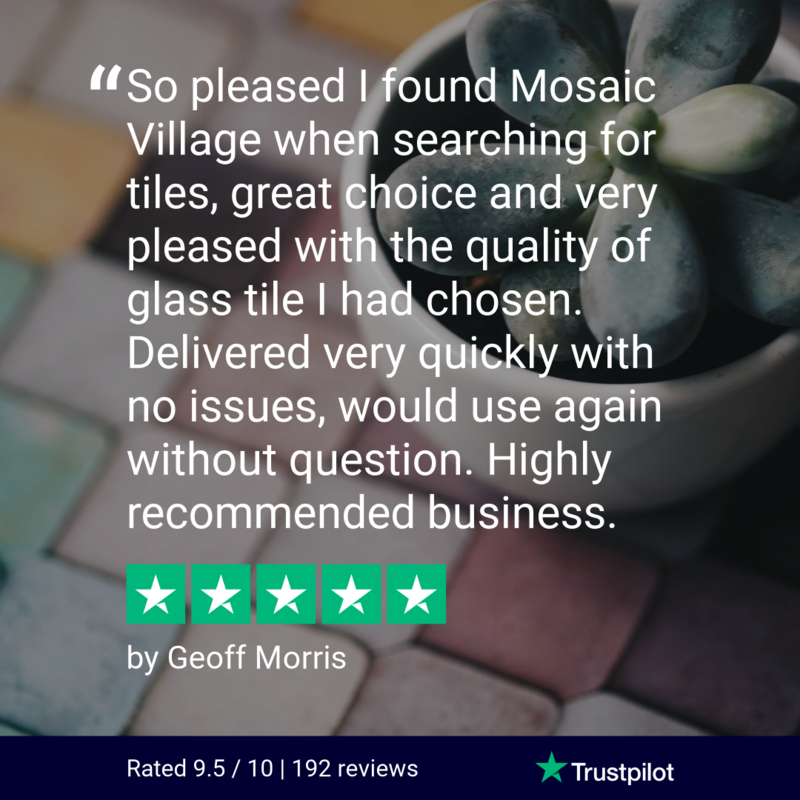 If you are looking for the best quality mosaic tiles in the UK then visit Mosaic Village – we pride ourselves on customer satisfaction and encourage our customers to buy the right products for their home. By using our mosaic tile sample service you can take your visualisation process one step further and see the products in your own home.